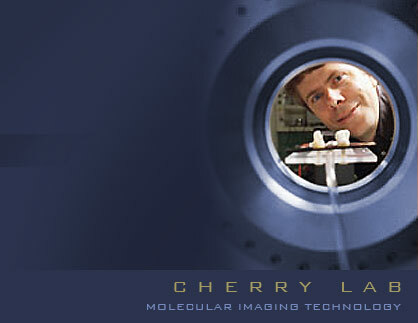 The Cherry Laboratory’s research is focused on the rapidly growing field of molecular imaging. Molecular imaging uses non-invasive imaging technologies to visualize and characterize specific molecular events and targets in vivo. Areas of active research include the development of new and improved imaging technologies, the design of novel contrast agents and imaging probes and their application in molecular diagnostics and therapeutics. Technologies and techniques under study include positron emission tomography (PET), single photon emission computed tomography (SPECT), x-ray computed tomography (CT), and optical imaging. The group is exploring integration of PET imaging with CT and MRI systems. The research group has many active projects in the laboratory, ranging from the development of new detector technologies for imaging to the building of complete imaging systems for specific biological or medical applications. The research associated with these projects involves novel detector development; system simulation and design; the investigation of data acquisition and correction strategies; the study of three-dimensional image reconstruction algorithms; new software tools for the visualization, analysis, and quantification of imaging data; and the application of molecular imaging technologies to important problems in medicine and biology.